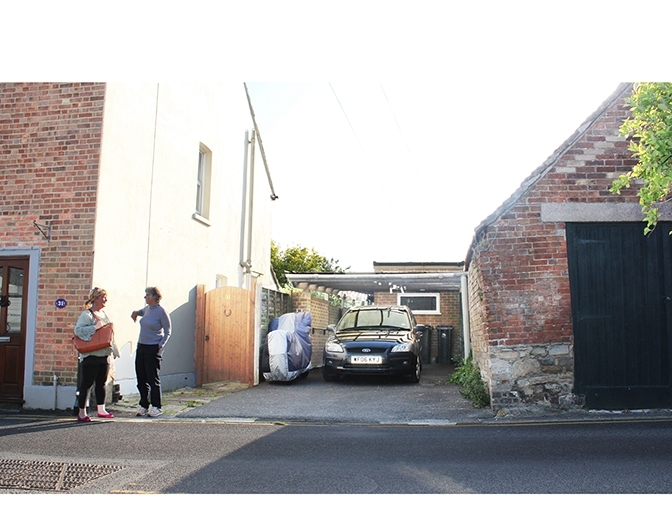 Image of proposed change to front of house - 33 Mill lane, Wareham, BH20. This existing three bedroom house is a single storey 1970’s architect designed house that is set back from the street and is accessed via a corrugated plastic covered alley that leads past a thin block of two uninhabitable storage rooms. The rest of the rooms of the house are all arranged around a courtyard that faces Eastwards. The main feature of the house is the open plan living and dining space that fronts the courtyard. However the bedrooms are generally too small at present for the owner’s uses and guests and there is need for many general repairs, particularly to the roof and external walls. The proposal includes the addition of a new study, shower room and W.C., utility room and new bedroom towards the front area that will be enclosed. This will require the demolition of the existing two storage rooms and the creation of a new gallery/corridor (with several openable roof lights) that will lead to the existing corridor on the North side of the house. The proposal also includes the rendering of all the external walls, both in the courtyard and along the boundaries, as these walls are presently made of unfinished exposed blockwork and are unsightly. The existing master bedroom shall have a new extension that will be 200mm higher than the existing and house a square window seat within. The main rear elevation shall be entirely opened up and supported by steels that will also support four grey aluminium sliding doors. The existing sun-room and second bedroom shall also have a steel incorporated into it to support two similar sliding doors. This second bedroom will be formed by removing the wall between bedroom 2 and bedroom 3 to create a single larger bedroom. Along the existing corridor a wall of full height storage units shall be created for storage. Adjacent to the kitchen there is a small courtyard that is proposed to allow light to the bedroom 3 and kitchen. The new study will be located at the front of the house and will have a circular aluminium window. The new studio at the rear of the house will take the space of the existing sunroom and shall also have a fixed circular window of aluminium that shall form a window seat. All along the perimeter of the rear elevations the existing plastic UPVC fascia boards shall be removed and a stone coping shall be built to edge the rear perimeter that shall also be rendered. All around the perimeter at ground level there shall be a ledge of Purbeck stone slabs, except below the master bedroom, which shall be of a grey engineering brick plinth. All walls shall be white smooth rendered and in the perimeter of the courtyard the removed fascia boards shall be replaced by rendered cement and Purbeck stone coping. The square and round windows seats in the master bedroom and the studio shall be aluminium framed windows that are to be clad in lead. The round window at the front shall also be aluminium framed. The step leading to the front door shall be of Purbeck stone as shall the driveway sets, that shall be set into a sand base and drained via a linear soak-away. There shall be metal contained lights at the front and back that shall illuminate the front door and courtyard. The front door shall be a single timber panel with slot window and the front wall shall be rendered, as shall all the walls, and will have a coping of Purbeck stone. The roof of the new building shall be of standing seam lead and the existing roof that is likely to need repairing or even replacing is to be of standing seam lead also. The front entrance is accessed via a driveway that is 10m long and sufficiently wide and deep to allow for two cars to park, with bins and bicycles situated at the side. The corridor that is to replace the alley is relocated on the North side and is to be enclosed and form part of the house that acts as a continuous spine from front door all along to the back master bedroom. Along the front of the corridor are located the new study, a utility room, a shower room and W.C. and an extra bedroom with courtyard. From here there is a small hallway like adjacent space that also overlooks the hallway and like the bedroom opposite will have sliding aluminium doors onto the courtyard. This small space leads to the main open plan living and dining space and the kitchen. This open plan space has open views and will offer direct access to the gardens in the courtyard. At the back of the living space of this open plan room there will be a studio that will be located where the current sun room is situated. This studio, like bedroom 2, will also as mentioned above, have sliding doors onto the courtyard. The present front area of this house has a few dilapidated and uninhabitable spaces that let the rest of the house down and waste space. By developing this space to create a new study, bedroom and utility and shower room the house can function well enough to cater for family guests, including grand children and the storage this would incur. Also the opening up of the rear elevations of the master bedroom, bedroom 2, the studio and most importantly the living and dining space will create a most generous and light filled space that would frame the courtyard and its planting. As the owner is a landscape gardener who has had extensive experience of working in Japan, the features such as the courtyard, sliding doors and circular windows reflect both her cultural roots, but also enhance this well designed courtyard house into something more contemporary- yet in keeping with the character and layout for which it was designed. In conclusion the additional space created and the carefully orchestrated cohesion of the courtyard, now with matching heights and door width panels will create a delightfully modest and intimate space suited for the older user who wishes to stay put and make use of having level access throughout and have children and grandchildren to stay. Drawing Plans for Mill Lane. Render of proposed changes to property. Render of proposed rear area. Photocollage of existing rear façade. Photograph of existing rear sun room.